Get started in minutes, only pay for what you need. It all starts here. Manage cashflow, payments, receipts and budgets, produce over 20 types of reports, reconcile bank transactions and more! Easily refine your online accounting software so you pay the lowest price! Only pay for what you need, and use the simplest day-to-day system possible to reduce accounting complexity. Create and send professional invoices from your mobile, and get paid faster. Import your latest banking and credit card transactions automatically into our online accounting software for easy reconciliation. 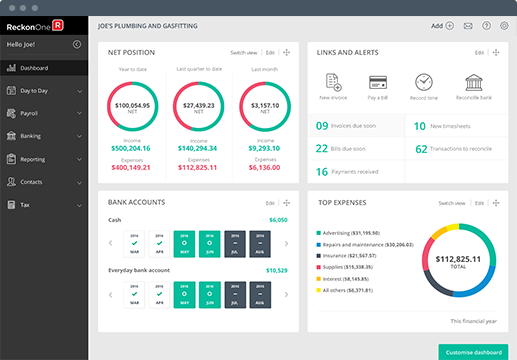 Manage your jobs and projects, and see real time information on their profitability. Essential for strategic businesses. Record time, and submit employee expenses from just $3/mth! Free for unlimited users. Great for a mobile workforce. Manage unlimited employees from $3/mth! Easily calculate employee pay, allowances, track leave and manage super contributions. Zapier is an online automation tool that allows you to connect Reckon One to a range of apps including inventory, eCommerce, CRM, project management and more. It reduces repetitive admin and streamline your workflows – all without the need for coding. See how each of our modules works in action at no cost to you.